Happy New Year to all the students of the Bujinkan Mizu Nagare Dojo, as well as members of the International Bujinkan Dojo who may be reading this message. With our Hatsugeiko rapidly approaching, I thought I would take the time to go over a couple points of dojo business, and say a few words about our training in 2017. First, please remember to bring your money for the International Bujinkan membership. I will bring it up at our Hatsugeiko as well, but be prepared to pay for your annual membership card. Second, please check in to make sure that you have received all paperwork from japan that you have already paid for. I have a few certificates that have not been picked up yet, and I would like to get them to their rightful owners. Finally, please note that my email for the dojo has changed. I can now be reached at ethan@MNDojo.com, please make the change in your email address book. 2016 was a year of great turmoil in our country. Whatever your political view, you can be certain that there was much violence sourced by the many frustrations in our society today. While I hope that no one is put into a dangerous situation because of these national tensions, I feel that it is an important time to take stock and have confidence in your level of preparation to flee, fight or hide, should the need arise. In the last few years, our dojo themes have addressed the fundamental building blocks of taijutsu as I was taught it. We’ve spent time looking at dakentaijutsu and jutaijutsu, following a year of koppojutsu and kosshijutsu. These two themes took an In-Yo approach to broad-brush fundamentals, and followed an intensive year of bojutsu study. I used this In-Yo approach because I feel that balance in study is very important, thus the delving into subjects that may, at first, seem opposing but more often end up complimenting and completing each other. In 2017, we will focus on shinken gata and jissen-gata. 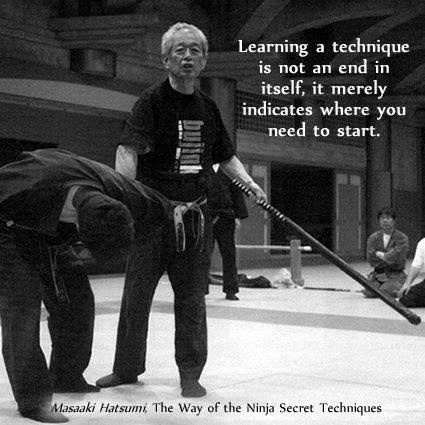 These terms are usually translated at “real fight,” “real combat,” or “self-defense” techniques in a practical sense. I would like students to understand these terms instead as a mindset of training, in which application is always a focus. There is a lot of talk on the internet about the way a basic is performed compared to how one would do it “for real.” However, I think this view shows a misalignment of understanding. While there is no question that the two might look different, I think it is important to understand that the form is a simple container, used to guide students the concepts, rather than a set method which should be used all the time. In this way, understand that the flexibility to perform henka blossom from understanding basic forms, rather than simply mimicking them. This year, we will spend time exploring how to approach henka form basic techniques. By taking some basic strategies, we can look at ways to approach training to keep it fresh and develop the mental, spiritual, and technical flexibility to unlimit ourselves, while constantly keeping the pragmatic and practical in mind. Expect to spend a little time in every class with a weapon in your hands. This year’s focus will be on smaller, hand held, or concealable weapons quite a bit, but expect to use larger weapons when the weather allows for outdoor training or class sizes are smaller. It will be my goal this year to close every class with weapons practice, applying what we learn from unarmed taijutsu to the weapons as well as applying weapon lessons to unarmed taijutsu. It is my hope that everyone will maintain consistency in their training outside of the dojo, so that time spent in the dojo can be as productive as possible. This is also an interpretation of jissen, recognizing that no teacher prepares us for battle. Rather, we prepare ourselves by assiduous practice of the things we are taught and the guidance we receive.